There’s been a number of new applications and services recently that are looking to extend the usefulness and fun of iTunes. I’m always looking for new ways to have a better iTunes experience. With that in mind, I thought I’d provide my thoughts on these new iTunes extensions. After the jump, you’ll find my thoughts on Qloud, The Filter, and Qloud. Qloud: Qloud is a people-powered music tagging service that integrates into iTunes and allows you to tag your songs. In theory this will provide you with a more customized personal database of songs that you can search for. For example, you can tag a number of songs from a variety of artists as Christmas if you feel the songs all have a holiday feel to it. Then you can simply search for Christmas to find those songs again. Along those same lines, you can go online to Qloud.com and find songs based on tags by people using Qloud. Then it effectively becomes a music recommendation service similar to how Last.fm works. As it is now, Qloud is still in a beta stage and pretty rough around the edges. Due to this, I’ve uninstalled Qloud as it is too rough around the edges. However, it has promise, and I wouldn’t be adverse to trying it out again in the near future. Some of the issues I had with it is that it is too slow, uses up too much resources, and the user interface is clumsy and confusing. The inability to tag albums is a major drawback, in my opinion. 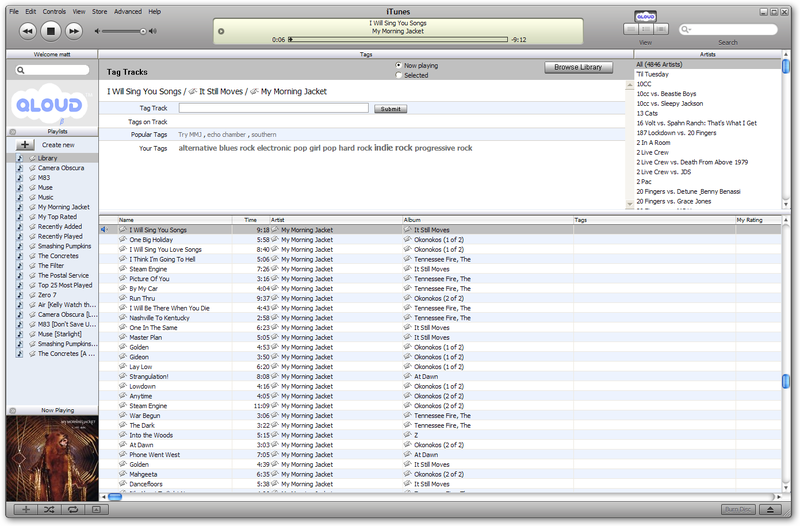 The font it uses isn’t the same as the size setting you have for iTunes, and for me, is too small to read comfortably. The blue Qloud icon that sits within iTunes looks out of place and mars an otherwise clean interface. Also, since the service is still new, the online version of Qloud isn’t terribly useful at this point. Once more people participate, it should be more effective. The Filter: With an endorsement by famed musician, Peter Gabriel, The Filter is grabbing attention as the application to get for your iTunes media player. What The Filter does is create playlists based on the song you’re currently playing (also the artist and the genre, your choice), and it does it smartly by accessing the All-Music Guide database for recommendations. Simply hit the big F button and it’ll create the playlist for you. Clearly, everyone’s mileage may vary because it depends on a few factors, but the biggest one is how big your library is. The Filter recommends that you have more than 300 songs, but it’d really benefit from a much larger library. I have 12,000 songs and based on the playlists I’ve created, it has not disappoint. In fact, of the three programs/services I’m reviewing in this blog post, The Filter is the only one that has stayed on my computer and seen regular usage daily. With so many songs, I’ve rediscovered a lot of songs I’ve forgotten about, and it’s like digging up treasure chests of memories each time. SpotDJ: SpotDJ, another application in beta testing, allows you to hear what others said about a particular song you just listened to. You can set it to only do DJ spots at certain intervals, or listen to one (if available) by pressing the SpotDJ button in the interface. With the way it is set up, it interacts with iTunes but isn’t really a part of iTunes. It pops up an interface that isn’t anything to write home about. If there’s no spot to listen to for the song you’re listening to, you can add one if you have a microphone plugged in, simply just hit the Spot this song button and record a spot for the song. 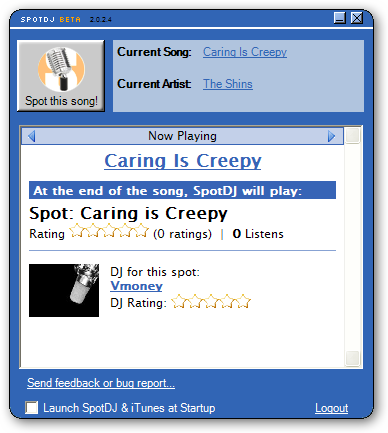 Then users can rate spots, and the spot that has the best rating is played for everyone else who listens to that song. SpotDJ has potential, but relies heavily on participation by users. The few spots I did get to hear, have either been too low to hear, too hard to understand what the DJ was saying, or background noise was too loud. Obviously the rating system should take care of that, but as it is in this early stage, it’s not entirely fun to use now. On top of that, the program eats up a huge amount of resources. As I’m looking at it now, it is at 50MB. That’s a lot for a program with a simple function. Update: Be sure to check out the comments, as the co-founder of SpotDJ addresses the concerns I brought up in this post, and provides some clarification on what they’re working on. Thanks for taking a look at SpotDJ. Just wanted to clarify a couple of things. We know that the app is, well, fugly. We’ve done a lot of design work on the web site, and the app is up next. Regarding the memory consumption, the number listed by the Task Manager is very misleading. We’re a .NET app, so the Task Manager actually double-counts and includes the whole .NET runtime in our memory consumption. If you minimize SpotDJ to the task bar, Task Manager will report that we’re using a svelt couple of megabytes. The content on SpotDJ is obviously just getting going, but we already have a lot of really good stuff. There’s professional-level commentary from Rock journalist Ben Fong-Torres (http://www.spotdj.com/bft) and amateur content with some really interesting things to say. We’re working on normalizing spots to a consistent volume, which should help address your audio quality concerns. Anyway, thanks for trying out SpotDJ. I hope you’ll keep an eye on us as we continue to improve it! Thank you for the update Klep, it’s good to see you guys are on top of things. I’m personally looking forward to this service growing, as i’d love to hear other people’s commentary on my favorite songs, and to discover new ones via recommendations.